Does this seem familiar? You’re in a meeting. Maybe it’s a workshop around equity and social justice issues, maybe it’s your community group holding a planning meeting for their next event. Pat makes a suggestion, and folks keep talking, ignoring the suggestion, proposing others. When Riley makes a similar suggestion, suddenly everyone is excitedly discussing the idea and expressing gratitude to Riley. As you see the dejected look on Pat’s face and notice Pat has stopped talking, you feel frustrated! You’ve seen this happen with Pat and Riley many times. And you see this behavior playing out repeatedly, with people similar to Pat and Riley. Pause a moment as you read this and check in. Is this pattern familiar to you? What gender do you think Pat is? And Riley? Do you see it happening for people from some groups more than other groups? As a coach for groups of all sizes, I hear from people who notice these patterns and don’t know how to respond. They share their despair that, even when they try to bring attention to the patterns, so many people don’t see it, don’t know what they’re talking about, or actively deny the pattern exists. What can we do when someone tells us we’re contributing to a pattern we’re genuinely not seeing? What makes these patterns visible to some people but not others? 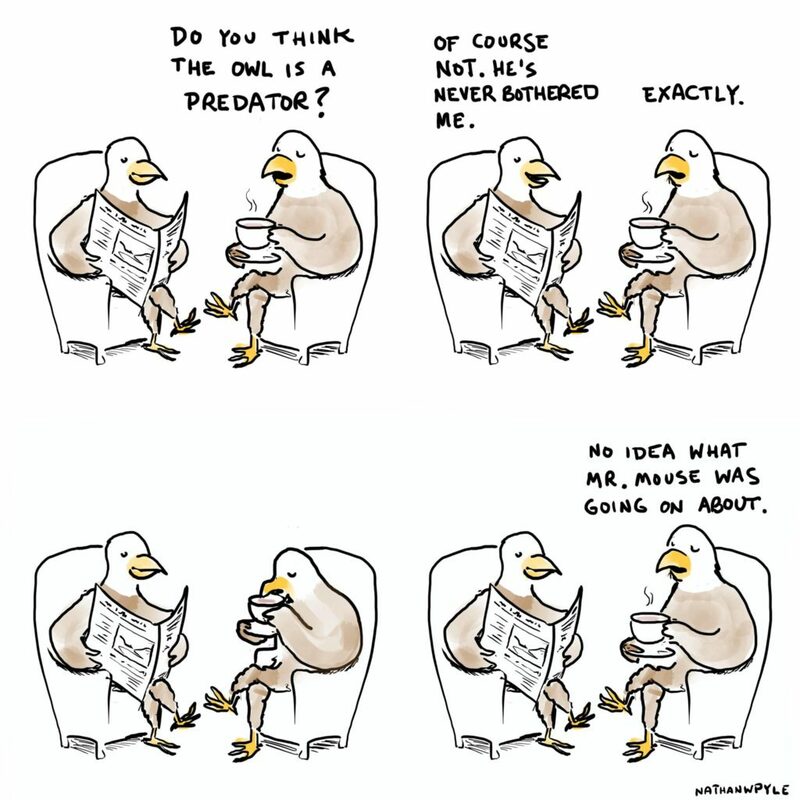 Illustrator Nathan Pyle’s cartoon helps us understand why some people just don’t seem to get it! ©Nathan W Pyle, www.instagram.com/nathanwpyle/ Used with permission. So, what’s going on? It’s a matter of perspective. Just like your physical location in a room determines what you can see out the window, our social location determines what we can see in our world around us. Sometimes, this seems obvious. As a physically mobile person, I was used to walking around my neighborhood with ease, bouncing in and out of my home with no issues. When I had knee surgery and I lost my mobility, I became aware of things that, had I been differently abled, I would have noticed all along. I became aware of how high the step was to get into my apartment. I discovered how high the bathtub actually rose, how much effort it now took to step into the bathtub. Several months before the surgery, I remember someone asking, before coming to my home, if it was accessible. I had quickly said yes, dismissively noting, there’s just one step up to the front door. After the surgery, I realized how inaccessible my home actually was. Be empathetic. You don’t have to have the same experience as another in order to understand the impact that experience might have. I don’t have to lose a child to illness in order to empathize with a parent who did. And, perhaps that parent believes their child’s death was caused by a medical error, a belief I don’t share. I can still empathize with their pain without having to accept the causation they believe is true. But, so often when it comes to differences in experience grounded in differences in social location, we forget about empathy and want to explain ourselves until the other person sees things our way. Just empathize. Be curious. When we learn about another person’s experience that seems to contradict our own, let that be a signal that lets us know there’s a fork in the road we have not yet explored. Ask the person to share more about their experience. It’s important to be open minded – ask them to share without questioning their experience. In those moments, when there’s an apparently huge gap between their experience and mine, I ask myself – what aspects of my social location might be protecting me from having or seeing that experience? And, what aspects of their social location might be contributing to the experience they are having? Is there anything about their personal histories that might be impacting this difference in perspectives. The important things is not to assume that my perspective, my experience, is the only true one. Instead, remain open to the idea that there are multiple objective observations and viewpoints that could all simultaneously be true. Acknowledge impact before intention. Because of our differences in social location, my well-intentioned actions might have a very different impact on another person than I intended. When they call out this impact to us, let’s strive to change a very common pattern in these situations. Our intention, the perspective informed by our social location, is often so strong that we try to get the other person to see and recognize our intention, to understand the situation from our point of view. Instead, focus on empathy and curiosity first. Tend to the wound before you try to explain how the wound occurred. It often seems, when it comes to understanding each other, that we’re standing on opposite sides of the Grand Canyon, trying to see other across a large divide. This is what living in the United States seems to me these days – many people, hurting with a very real pain, loudly screaming with word and action to be understood, to be heard. Let’s take time, first to hear and truly understand the needs and experiences of those whose perspectives have long gone unheard, and then to have our needs be understood. I trust that when we can do this, we’ll be energized to create partnerships that attempt to meet meet all our needs, not just yours or mine. Social location is our group membership, determined by our gender, race, social class, age, ability, religion, sexual orientation, and geographic location.